A frittata is an egg-based Italian dish similar to an omelette or crustless quiche, and it’s oven-baked to a golden perfection in the same pan it’s made in. Quick and easy, my kinda recipe. Add oven fries and some fruit on the side and you’ve got a monster meal, a breakfast for dinner, or just dinner. The basics of a frittata consist of a vegetable, cheese, and egg. As for vegetables, I go for colorful combinations like tomato-potato-spinach, or zucchini-eggplant-roasted red pepper. In fact, you can layer as many vegetables as you want and stack them in the pan like a torta. My favorite vegetables for frittatas are potatoes, spinach, asparagus, mushrooms, bell peppers, summer squash, tomatoes, artichokes, cauliflower, broccoli and leeks. Italian cooks have been known to give their frittatas a lasagna flare by adding a single layer of flat pasta like egg noodles somewhere in the mix. As you can see, the frittata is an artist’s palette open to creative interpretation. 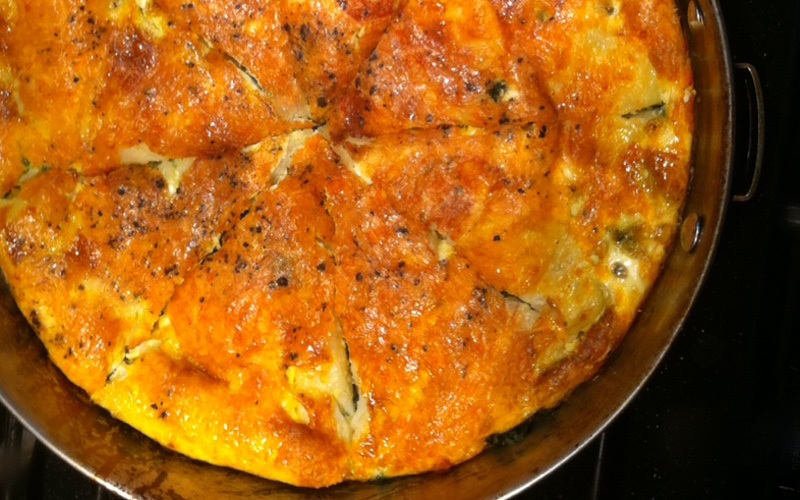 Fritattas are delicious hot or cold — in fact the one I made for dinner last night was also breakfast this morning. Have the sriracha or Cajun garlic sauce handy if you want to kick it up a notch. With a shallow cast-iron pan or skillet that can go from stovetop to oven, saute the vegetables over medium heat in a little olive oil and salt until crisp-tender. Do it in batches if you have vegetables that need a little more heat (cauliflower, broccoli, potatoes) compared to those that don’t (tomatoes, onions, spinach). Toss in salt and pepper as you cook each batch. The idea is to get the vegetables to release and boil off most of their water so the frittata doesn’t become soggy. Use a lid to steam the vegetables if you want them to cook faster. Move vegetables to a bowl as you go along. Remove any excess oil from the pan, and allow the pan to cool slightly. Put vegetables back into the pan. Pour in the eggs on top of the vegetables, then scatter the cheese over the eggs. Scatter the Parmesan cheese on top. Transfer skillet to the oven. Bake about 20-30 minutes or until a knife inserted into the center comes out clean and there is no liquid visible in the cut mark. The top should be slightly golden. Don’t let it get darker on top because that will mean the interior of the frittata is overdone! If you must have a darker top, then put the frittata under a broiler for a minute, being careful to watch it doesn’t burn. Remove from oven and let sit a few minutes to bring it closer to room temperature. Scatter the parsley on top, slice like a pie and enjoy!